The Media Office of the Senate President says that the stolen N310 Million was never stolen from Saraki’s House and insisted that he had nothing to do with it. This was stated in press release made available to the media by the Chief Press Secretary to the Senate President, Sanni Onogu on Sunday in Abuja. 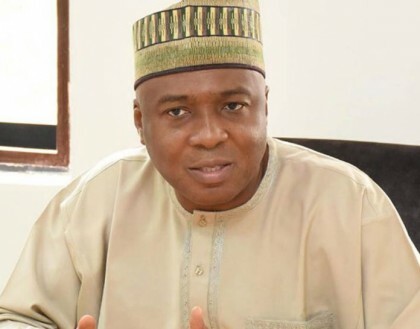 “The attention of the Media Office of the Senate President, Dr. Abubakar Bukola Saraki, has been drawn to a rehash of mischievous and concocted allegations aimed at misleading the public with spurious claims that the Senate President allegedly owned the sum of N310million said to have been stolen from a Bureau de Change operator in November 2015, by suspected operatives of the Department of State Services (DSS) and some army personnel. “This Office wants to reiterate that the Senate President had nothing to do with the said stolen money by suspected security agents then and even now as being maliciously peddled by some online media to tarnish his image.” He said. Onogu said: “It would be recalled that when the incident was reported by the media in December 2015, a section of the online media which has become notorious for dragging the name of the Senate President into issues that he knows nothing about, the DSS issued a statement where it stated that it had arrested some of its men that partook in robbing a Bureau de Change operator in Abuja. He insisted that the Senate President had nothing to do with the money and we challenge those still rehashing the stale and fake news to avail themselves of the reports of the police and the DSS on the matter to avoid misleading members of the public unnecessarily. Onogu stated that the Saraki has no army personnel among his security details. Therefore, it becomes absurd for one of the suspect in the robbery to have claimed according to the report that the money was brought to the Senate President’s house from where they connived to steal it. According to him, the report remains a lie which must be disregarded by the public, and should it be recirculated tomorrow, it will still remain a lie and that the public deserves a better deal from its sponsors and purveyors. “bent on rubbing mud on the reputation of a distinguished Nigerian, who is today in his capacity as the Senate President, is working assiduously with critical stakeholders to stabilize and grow our economy. Enough is enough.” He added. 100BÂGS,TRÀILER LÖAĐ OF 600BÀGS AND TRÁILÉR LŌÀD OF 900BÀGS ABÕVE.